Since 2011, the Detroit Police and Fire Retirement System has appointed four receivers to collect on a $10-million unpaid loan to repair and sell homes to low-income buyers. After discovering an elaborate Ponzi scheme and filing multiple lawsuits against the three debtors, one partner committed suicide while the other two fled and are thought to be in Panama. When 60 Detroit houses popped up for sale on eBay in August, it was only fitting that the properties, remnants of a $10-million scam on a city pension fund, found few takers. In fact, none of the 60 dwellings, many of them in the reviving Boston Edison neighborhood, drew any buyers. The listing of the homes, many of which were saddled with large amounts of delinquent taxes, offered the most recent public glimpse of a protracted legal battle buried for years in thousands of pages and boxes of old files in Wayne County Circuit Court, as well as in files in state and federal courts nationwide. Just as the Internet auction came up empty, lawsuits by the Detroit Police and Fire Retirement System have been mostly unsuccessful in recovering the $10 million trustees loaned in 2008 to Detroit businessman Abner McWhorter and his Paramount Limited company. Within two years the loan was in default and in May 2011, the pension fund filed suit against McWhorter and his two partners. Two months later, McWhorter filed for Chapter 11 bankruptcy. Five weeks later, he was found shot to death — a suicide, according to the Wayne County medical examiner. Also named in the lawsuit were McWhorter’s partners, George and Teresa Kastanes from South Carolina, who fled to exotic hideouts in the Caribbean and Central America amid accusations of fraud. George Kastanes also filed for bankruptcy protection in Miami; he was arrested there in 2012 after a judge issued a warrant for ducking the Wayne County lawsuit filed by the police and fire fund. He was later released. A federal bankruptcy court in Miami would eventually rule that the revitalization plan McWhorter sold to the pension trustees was merely a Ponzi scheme. The court said the partners were initially repaid a part of the loan with money they received from the fund. The 60 homes advertised on the website in August, priced between $9,400 and $50,000, are a fraction of the 1,400 Detroit distressed properties that were purchased with pension fund money. The police and fire trustees initially declined to invest in Paramount, but then loaned the money on the sales pitch that it would revitalize neighborhoods while helping Detroiters in need of affordable housing. 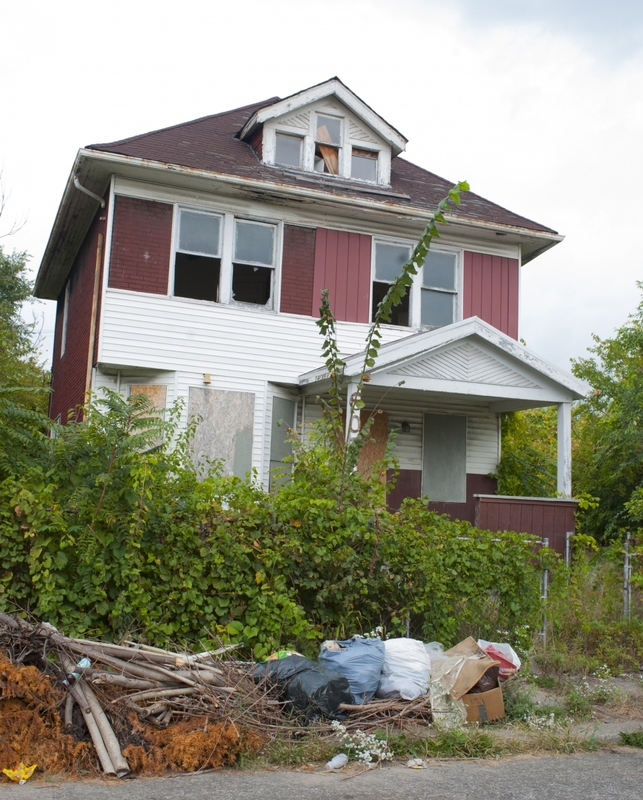 Instead of helping, however, the vast majority of the homes bought with the pension funds were temporarily recycled out of foreclosure only to be abandoned or destroyed within months, exacerbating Detroit’s massive foreclosure and blight problems. The 1,400 Detroit homes are also nearly one-half of 2,500 similar properties the partners purchased in 30 other states using the police and fire pension fund’s money that was earmarked to help Detroiters. The fund won judgments against the partners in courts in Miami and Wayne County for amounts that now nearly double the original loan. The trouble is, George and Teresa Kastanes and the more than 17 shell companies they created declared bankruptcy and have no visible assets. Since 2011, the pension fund, through its lawyer, Marie T. Racine, principal of Racine and Associates in Detroit, has gone through three court-appointed receivers and is now working with a fourth trying to recover some value from the $10 million it lost. The failed attempt to sell the homes on eBay was made by the latest receiver, David Findling, managing partner of The Findling Law Firm in Royal Oak, who was appointed in October 2014 by Wayne County Circuit Court Judge John H. Gillis Jr., at the request of Racine. McLeskey says he’s sympathetic to the nearly impossible hurdles Findling faces in trying to get his arms around 1,400 distressed properties in Detroit. He learned firsthand of the problems when he tried to track ownership of a house listed as owned by one of 17 subsidiaries of the defunct Paramount holdings. “I know pretty well how to do this, and it took me a month to track down the owner of just this one property,” he says. While it appears that most of the properties have been lost to foreclosure or abandoned, other than a status report in March by Findling of his preliminary findings — which city sources say showed Paramount’s investment records in disarray — there has been no public accounting of the doomed pension fund investment. Findling did not respond to phone calls for comment for this story. In fact, none of his predecessors had any success corralling the failed investment. The first receiver, Steven Smith, quit after only a few days due to work conflicts. The second receiver, James McTevia, founder of McTevia and Associates, a turnaround management and financial consulting firm in Bingham Firms, says he advised the police and fire fund trustees to give it up after nine months, having received little cooperation from the Kastanes. According to McTevia he didn’t get records he asked for. Meanwhile, an FBI-trained expert discovered that 30,000 files in the Kastanes’ computers had been destroyed. McTevia says there was no point in continuing the receivership because the housing portfolio the pension fund paid for was a mess of junk, epitomized by empty lots where houses once stood. The underlying problem sorting out the properties was that they were bought out of foreclosure for as little as $1, then sold to unsuspecting buyers on land contracts, usually for about $500 down and $400 per month. The properties photographed for this article are some of the actual 1,400 distressed homes that were purchased in 2011 with pension fund money from the Detroit Police and Fire Retirement System by Paramount Limited. Today, the majority of the homes are abandoned or destroyed. There is no requirement that land contracts must be registered with the county, which meant the new owners were unaware at the time they moved in if there were back payments for unpaid taxes or overdue water, electric, and gas bills. In most cases, within a few months of occupancy, the owners were hit with staggering amounts in back tax taxes they could not pay. As a result, nearly all cut their losses and abandoned the homes. McTevia says not only were there phantom homes on vacant lots, there were properties with no records to support Paramount’s ownership or that of homeowners, and the majority were already in foreclosure with unpaid taxes, utility bills, and liens. His associates, who included retired FBI and Secret Service agents, auditors, and accountants who knew their way around, quickly determined that the police and fire fund had been victimized in a massive Ponzi scheme. “There wasn’t much left there to recover and we told them (the fund trustees) they should walk away and not spend any more money on it,” he says. 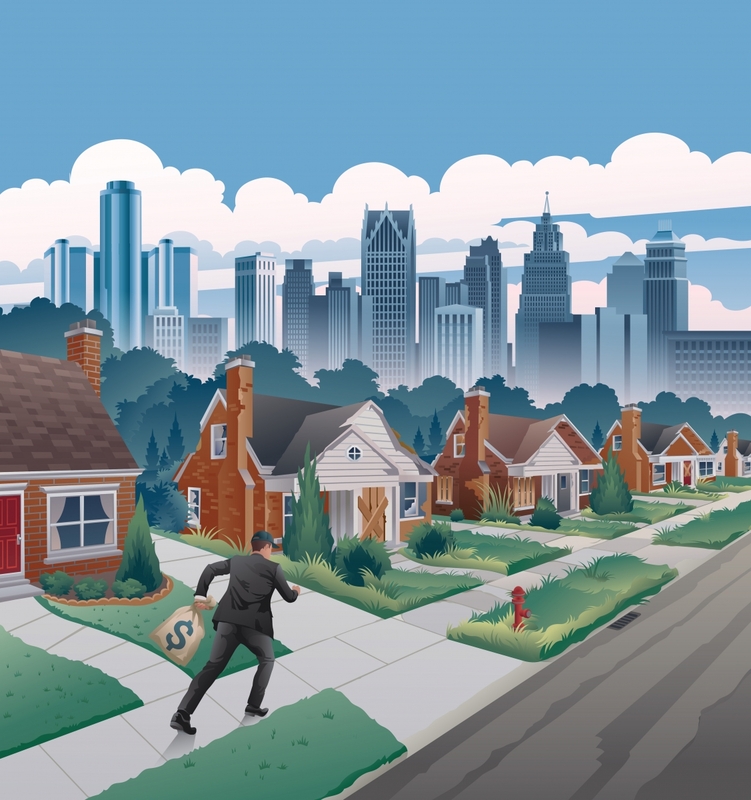 “The original concept of investing in homes to help low-income persons secure housing under land contracts in Detroit was a noble effort that did not work out as intended,” says Bruce Babiarz, a spokesman for the police and fire fund. McTevia, who has advised the pension fund for decades, thought his long-standing ties would carry more weight, but he was disappointed when the fund didn’t take his advice. Babiarz says the pension board had no control whatsoever over the properties since the court appointment of the receiver. After cutting ties with McTevia, in March 2012, Racine went back to Judge Gillis and secured a third receiver, Douglass Diggs, managing director of Heritage Realty Services in Detroit. He also served as director of Detroit’s planning and development department. His tenure lasted 19 months before Racine rescinded his appointment and replaced him with Findling. Babiarz said there were “irregularities” with Diggs, and he was dismissed in October 2014. Diggs says he was not aware of any “irregularities,” as Babiarz states. Judge Gillis says his only role with the case since it was closed in October 2013 was responding to Racine’s requests for new receivers. “We have not had a need for hearings, and I have no knowledge of any problems with any of the receivers,” he says. The odyssey of the $10-million scam began in 2008 when Abner McWhorter, then a 41-year-old business wunderkind, made his pitch to the trustees. McWhorter wasn’t a stranger to City Hall or the community he said he wanted to help. As a young boy, he began making money by selling candy before starting a lawn care business. At age 16, he acquired a half-interest in a doughnut stand at Trappers Alley in Detroit’s Greektown district. During his senior year in high school, he borrowed money from an uncle and opened a successful picture frame and art supplies store. That venture led to his landing a $130,000 contract as a supplier of art supplies and picture frames for the City of Detroit. McWhorter later wrote a book for African-American children who wanted to start their own businesses, and he founded and published a technology magazine. At age 31, he was honored as a rising star by the African-American Hall of Fame in Cleveland, where he shared the stage with Motown founder Barry Gordy, magazine publisher Bob Johnson, and Oprah Winfrey. He was recognized for a scholarship program he founded for Detroit schoolchildren, “Show Up to Blow Up,” which offered $1,000 to students with perfect attendance records from the ninth through the 12th grades. Needless to say, he received an attentive hearing from the police and fire trustees. They initially declined to invest in his company, but later on agreed to a $10 million loan at 18 percent interest. That change of heart was explained years later when former Detroit Mayor Kwame Kilpatrick’s corruption scandal erupted. Details emerged showing that the $10 million loan was part of more than $95 million in shady deals and bribes involving money from the police and fire retirement system, as well as the city’s general retirement system, that wound up in the pockets of Kilpatrick and his inner circle. Two police and fire pension officials convicted in that case, former Detroit Treasurer Jeffery Beasley and Trustee Paul Stewart, voted to give the $10 million to McWhorter. Since that time, Babiarz says the pension board has established a policy against individual real estate transactions going forward. Today, financial advisers favor only investments in professionally managed Real Estate Investment Trusts, or REITs, where risks are greatly reduced. Developed a professional plan to more closely balance the investment portfolio. However, by most accounts, the $10 million the pension board lost is unrecoverable. In fact, the task of tracking down the Kastanes became more bizarre as time went on. George Kastanes and his lawyer would later claim that McWhorter received $100,000 from a major drug dealer to hire Kilpatrick’s father, Bernard Kilpatrick, to help seal the deal. In return, the drug dealer received a cut of the properties. Bernard Kilpatrick has denied the allegation. It’s not clear how McWhorter hooked up with Kastanes, who was then in his early 60s, and his wife Teresa, nearly 10 years younger. They were principals in a flock of companies incorporated in South Carolina with similar names to McWhorter’s Paramount Limited entity. George Kastanes is a former pilot with Eastern Airlines who went to law school after the airline folded. After obtaining his law degree he went into the real estate business with his wife, buying up foreclosed homes and selling them to buyers who would not normally qualify for bank-backed mortgages — a plan eerily similar to the one McWhorter outlined to the board of trustees. With their debt to the police and fire fund now at more than $16 million, including interest, and with millions more in other judgments against them in courts around the country, the couple has dropped off the radar. After breaking the story on the $10-million heist, The Detroit News tracked George Kastanes in 2012 to a luxury hotel on the island of St. Kitts in the West Indies. He denied doing anything illegal, and said he and his wife were not crooks. While he cheerfully admitted to living it up on St. Kitts, he declined to comment on his wife’s whereabouts. Another news report said she was in Costa Rica undergoing treatment for an illness.